I portion (1,5 scoop) in the morning after waking up, II portion up to 1,5 h after training and III portion before sleep. I porcja (1,5 miarki) rano po przebudzeniu, II porcja pomiędzy posiłkami oraz III porcja przed snem. Using 3 portions of the supplement a day is not necessary. 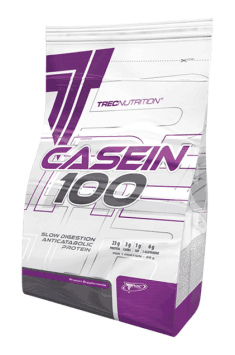 Casein is a protein characterized by a very long time of absorption and the best time for using it is the period before sleep or longest breaks between meals. During the day it is best to take advantage of fast absorbing proteins. It may be assumed that a daily dose of protein in a diet of sportsmen and physically active people should range from 1,5 to 2,2 g/kg of bodyweight. Therefore, if you do not cover your daily demand for this nutrient, you may apply it in the form of protein drinks, at the amounts corresponding to your deficits.